We’ve made the commitment (sent in the check) to reserve a table for the Exhibition during the upcoming New England Area PDC. The PDC is scheduled December 2 and 3, 2014 in Warwick, Rhode Island. We’ll be there for the exhibition December 2. For more information click here. 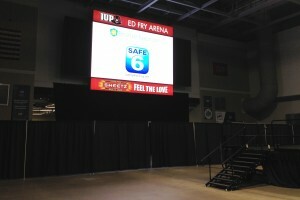 We’re looking forward to yet an other opportunity to spread the word about Safe 6 and The Safely Working Project!! Great Day at the WPA ASSE PDC!! I attended the Western PA ASSE Professional Development Conference in Indiana, PA yesterday and spoke with safety professionals, students and faculty from IUP and SRU about Safe 6 and The Safely Working Project. I was pleased with the response I got from people. Some looked at me a bit askance when I said it was a no-cost program. Everyone else there had a product or service to sell. I’m just trying to give everyone a free tool they can add to their safety training toolbox. It’s a bit overwhelming thinking about what it’s going to take to spread the word about Safe 6. Any suggestions would be welcome. The Safely Working Project is a sponsor and will have a table at the Western Pennsylvania ASSE Professional Development Conference this Thursday (16 Oct) in Indiana, Pennsylvania. We’re looking forward to talking to participants about The Project and Safe 6. 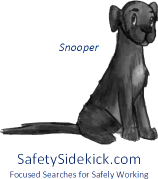 Meet Snooper, your Safety Sidekick and our mascot at The Safely Working Project. Snooper can assist you in finding the best information for Safely Working on the web using our focused search tool, SafetySidekick.com. This tool is being optimized for mobile use. You have several choices for searches including the following sites: OSHA, NIOSH, National Safety Council, and the whole World Wide Web. If you aren’t sure which site to search, use the Overview choice which returns results for all choices.